The small community of Kiewarra is stunned when Luke Hadler murders his wife and child before shooting himself, however some things about the murder-suicide don't add up and Luke's parents are desperate to clear their son's name. Federal investigator Aaron Falk has been a friend of Luke's since childhood and when he comes to town for the funeral, Luke's parents beg him to investigate but Kiewarra holds unpleasant memories for Aaron. Twenty years ago, Aaron was implicated in the tragic death of a teenage girl but the investigation stalled when Luke provided Aaron with an alibi. Although the truth never came out, both Aaron and his father were harassed by the community to the extent they were forced to leave town and Aaron isn't anxious for a repeat performance. However, it seems Kiewarra has a long memory and Aaron's very presence is reopening old wounds which complicate the investigation into the deaths of the Hadler family. 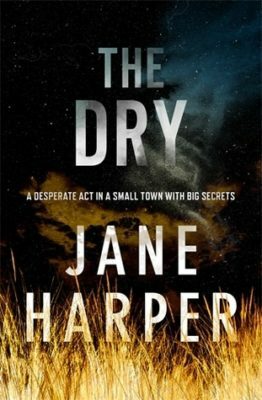 I read a lot of crime novels but when I read the blurb for The Dry, I was hard pushed to remember if I had ever read any set in Australia and that’s what ultimately drew me to this book. Since we are exposed to a lot of Australian television in the UK, a lot of the Aussie terms didn’t cause me any trouble but the author goes with the assumption the reader will understand what she means and doesn’t bother explaining anything. It’s a small point to make as it won’t spoil your enjoyment of the novel but it can be a little bit irritating. Instead of being set in a large town where murder is more prevalent, this book is set in a small town called Kiewarra which has been suffering from the effects of a long drought. Since the drought is causing hardship to farmers, it isn’t too hard to believe Luke Handler has snapped under the pressure and decided to end his family’s misery. The descriptions of the setting are excellently done with the author fully utilising the harsh realities of a town being crippled by drought throughout. In fact, the drought returned to the forefront at the climax of the novel in such a way it had me internally applauding the author’s choices. The main character, Aaron Falk, is likeable although I didn’t really get the sense I knew him particularly well by the end of the story but since this is the start of a series his character will likely grow. As a federal investigator, Aaron mainly investigates money issues, such as embezzlement, which doesn’t exactly fill me with enthusiasm at the prospect of further books, however I’m intrigued enough to find out. In The Dry, we don’t really see Aaron at his best as his emotions are in knots, not only over the death of Luke’s family, but also at being back in the town that treated him so badly when he was a teenager. Having said that, there are enough glimpses of his investigative skills to make you accept he is good at his job. As Aaron’s past comes back to haunt him, the atmosphere in Kiewarra becomes increasingly hostile and while he is subjected to being shunned and his car vandalised, I never felt Aaron was in any real danger. The events of the past are revealed through flashbacks via various characters who were connected to Ellie, the young girl who died, but this story is quite predictable so I basically lost interest in this part early on even though the author attempts to switch things up a bit to muddy the waters. The investigation into the deaths of the Handler family is a slow burner, mainly because Aaron is so reluctant to get involved initially and ends up being dragged into it somewhat against his will. There are a enough twists and turns to keeping you guessing as to what really happened to the Handler family and while the Kiewarra police may be a bit out of their depth, they don’t act like clueless country bumpkins either. While I think The Dry is a well written and solid debut, I wouldn’t say it brought anything new to the genre but I’m interested enough in the main character to see what happens next.